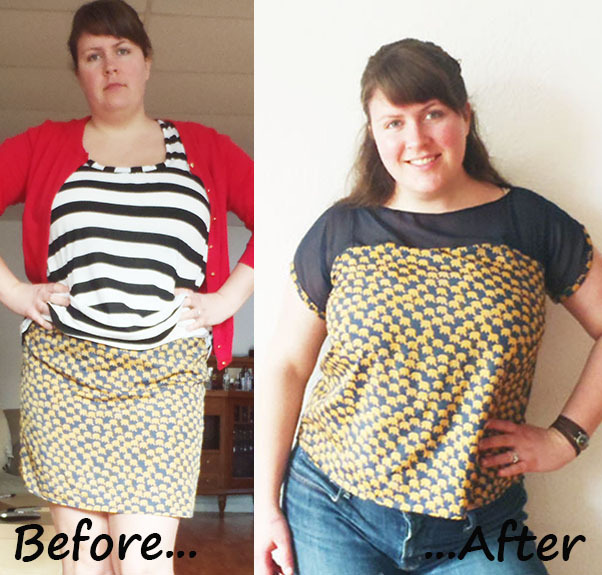 Ele-Fun Refashion (And Blue February Sew Along)! So I have this skirt that I never wear but won’t throw away because the fabric is just so cute! Look how happy I am to be wearing my skirt! It’s comfy and a nice length but really, really hard to find tops to pair with it. 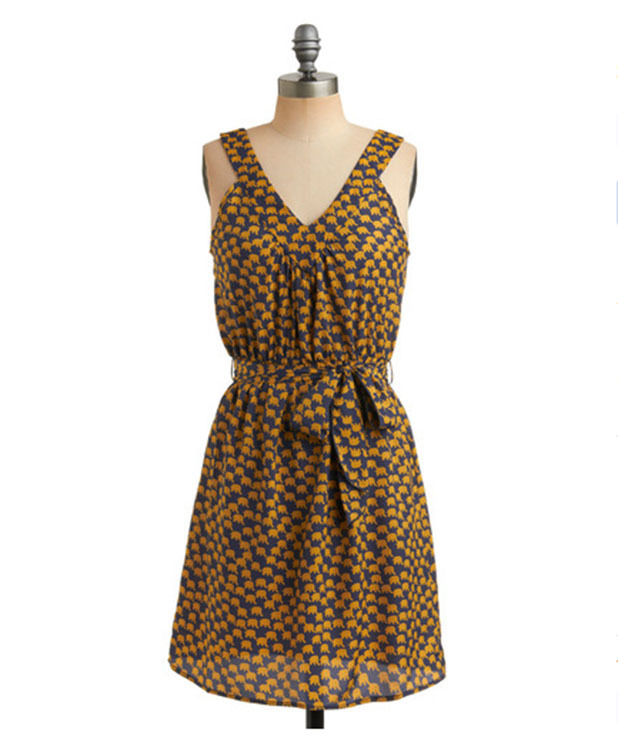 I have both mustard yellow and navy tights that look quite adorable with it but have never been able to find the right top. 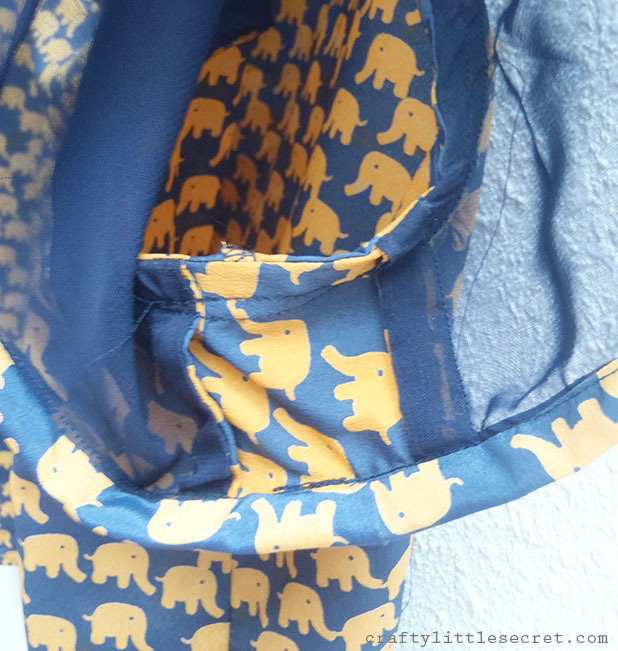 And so it sits, languishing in my wardrobe, tiny little elephant eyes forlornly begging to see the light…. 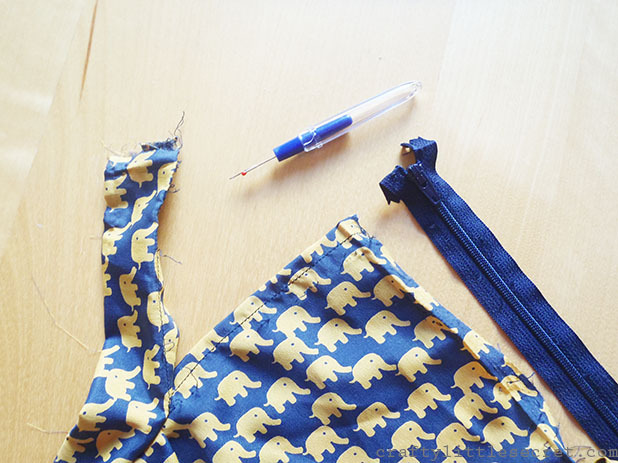 Well little elephants, your day has come because I have decided to kill two birds with one stone; make a refashion, and participate in my first ever sew along! This month is Blue February which was the final push I needed to actually get started on this project! Truth be told I think the original dress was the cutest variation. Sigh…..if only it had fit! So I guess this is really a refashion of a refashion! Anyhoo, I started by ripping out the zipper I had carefully sewn into the skirt and removing the waistband (which I saved to use as bias tape later!). I figured that if I made the skirt into a top it would be way easier to wear because it would look great with a pair of jeans. Easy peasy! The first time I refashioned the dress into the skirt do you think I saved any of that extra fabric? Nope! So I only had what was in the skirt and unfortunately, it wasn’t enough to cover my shoulders and my tummy at the same time (something I consider a minimum criteria for shirts these days). 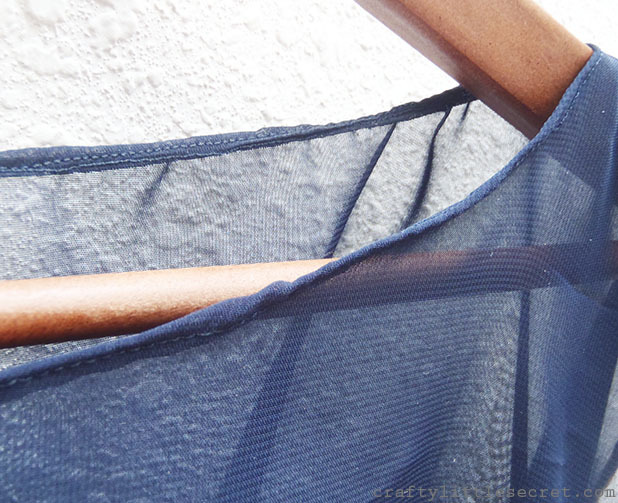 I went out and bought myself a half yard of navy chiffon for $3 to create a sheer detail across the shoulders of the top I was making. I used the yoke from a pattern with a nice neckline (my favorite Mathilde blouse), altered it (somewhat successfully) to include sleeves, and used that to make the front and back sheer portion of my new top. This was my first time working with chiffon and boy oh boy does it fray, so there is a rolled hem under the bias tape to try to keep everything together. Likewise, all the seams are French seams. This also helps keep things looking pretty since the top is sheer. You can sorta see the French shoulder seem in the photo above and here is a picture of the armpit and back seams. 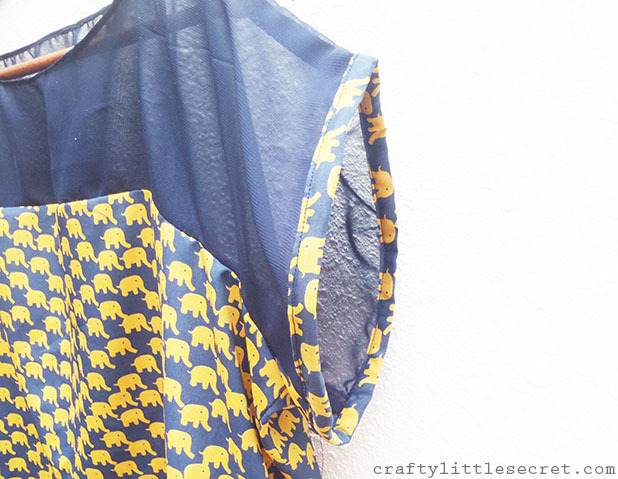 I toyed with the idea of putting the elephant trim around the neckline too but thought it would be too much. So instead I tried another first – my first rolled hem! Or rather, I watched YouTube videos about how to make a rolled hem and realized I would need to buy a special foot for my machine so then I just kinda did my own thing. But it turned out pretty well and hopefully if I wash it really carefully the fraying will keep to a minimum. If you exclude the price of the original dress (which I do because I spent that money like three years ago), I spent a grand total of $3 and a couple of hours to have this completely adorable and completely wearable new shirt. Totally worth it in my book! 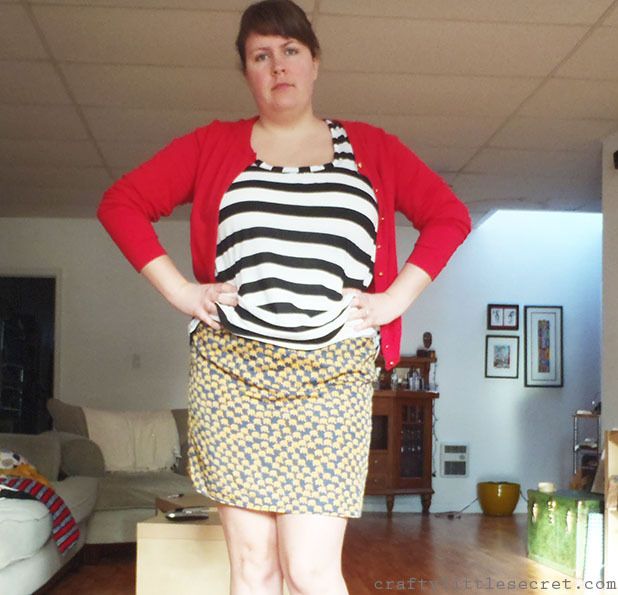 This entry was posted in DIY, Refashioning/Mending, Sewing Projects on February 26, 2014 by missphd. I love this top. It is so cute with jeans. Much cuter than the skirt. Good work. Thanks! Hopefully I get some wear out of it! Cute top! You did a nice job turning the skirt into a top. 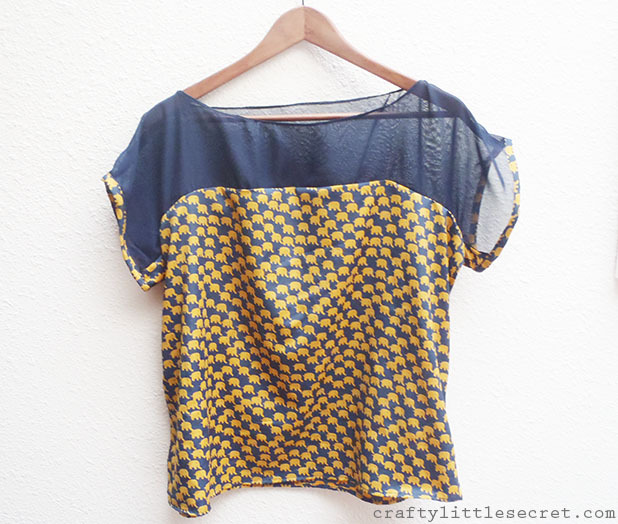 Sewing on chiffon is hard, I think – it really adds a lot to the top of the shirt though – great idea! Thanks! Sewing with chiffon is a little tricky but wasn’t as bad as I was dreading. I spent a little time playing with the tension before I started sewing and talked to the people at my local fabric store to make sure I had the proper needle (I went with a 10). Time will tell whether I sewed the seams well enough to keep fraying in check! 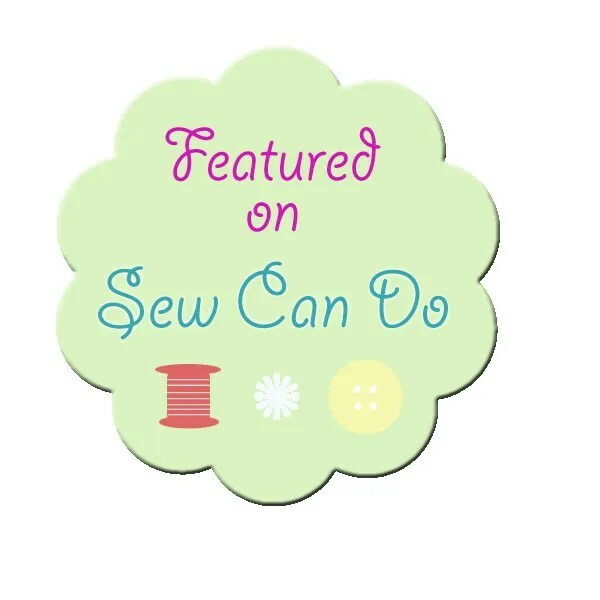 did you make french seams? Yup! I wanted to keep everything nice and neat, especially since the top of the shirt is see-through. 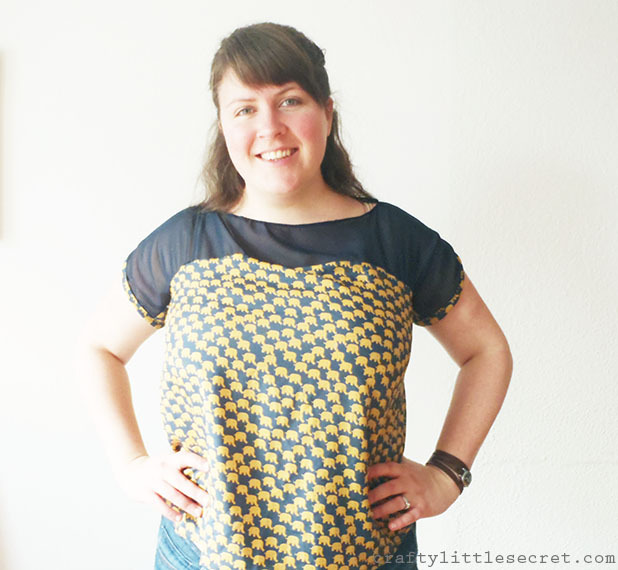 Super cute fabric made into a super cute top. 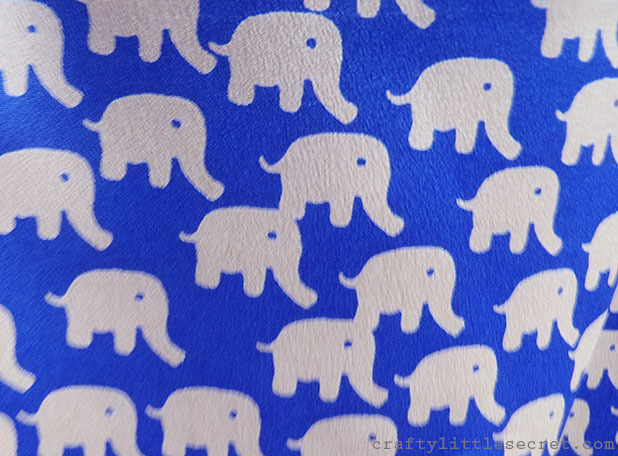 I’m so glad you went to the effort to get a usable garment featuring the little elephants.